Memorial service will be held at 2:00PM on Thursday April 5, 2018 at Plum Coulee Bergthler Mennonite Church. Viewing will be from 1PM-7PM on Wednesday at Wiebe Funeral Home, Winkler. Interment prior to the service at 1PM at the Plum Coulee Cemetery. 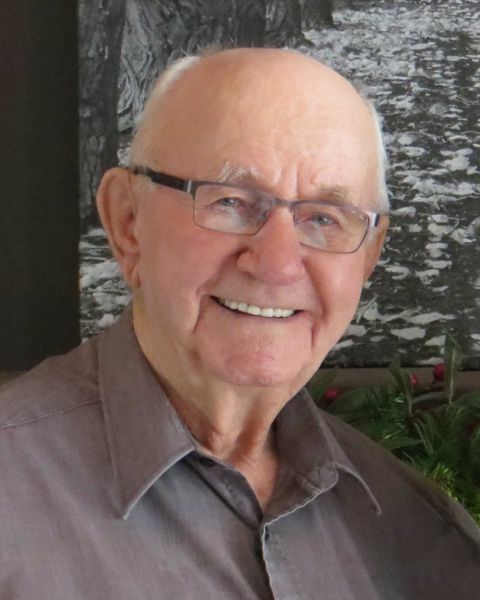 On Thursday, March 29, 2018, John W. Giesbrecht of Buhler Active Living Center in Winkler, MB formerly of Plum Coulee, passed away peacefully in his home, to be with his Lord and Saviour in heaven. He enjoyed his life on earth here for 92 years and 202 days. He will be missed by his three children – Edward (Grace) Giesbrecht, Carolyn (Ron) Wiebe and Ray (Deb) Giesbrecht, all of Plum Coulee. Also cherishing his memory are nine grandchildren and fifteen great grandchildren, one sister, one sister-in-law and many nieces and nephews. He was predeceased by his wife, Agatha in 2017, his parents, William D. and Maria (nee Stoesz) Giesbrecht, two brothers and one sister. John was born on September 8, 1925 in the New Kronsthal area, north of Plum Coulee, to William D. and Maria Giesbrecht. He was baptized upon the confession of his faith in 1946 in the Sommerfelder Church. It is in this baptism class that he met his lifelong love, Agatha Harder. On September 19, 1948 he and Agatha were married. They were married 68 + years. They lived and farmed just south of Plum Coulee, up until 1983, when they moved into Plum Coulee. In 2002 they moved to Cedar Estates in Winkler and enjoyed life together for almost 15 years until Mom passed away. It was about a month later Dad decided to move into Buhler Active Living Center also in Winkler. On July 26, 2017, which was the same week he had planned to move, Dad broke his hip and had surgery to repair it. Then he had a heart attack two days after his surgery and remained in hospital for a couple more weeks before finally moving into Buhler in the month of August 2017. The celebration and honouring of Dad’s life at 2:00 p.m. on Thursday, April 5, 2018 at the Plum Coulee Bergthaler Mennonite Church with interment prior to the funeral at the Plum Coulee Cemetery. Thank you to Wiebe Funeral Home for their kind and considerate service provided as well as to Dr. Basson and the many home care workers for their kind care. Thank you also for all the prayers, cards, visits, food and loving words shown to the family during this difficult time. If friends so desire donations may be made in John’s memory to the Plum Coulee Thrift Shoppe. Dear Carolyn, Edward, Ray & families. I’m so sorry to hear of the loss of your dad. Once both parents are gone it sure leaves an empty mess in your life. I’m out of the country and will be unable to attend the service but my thoughts are and will be with you. Sincerest Condolences. My condolences to you Carolyn; always appreciated meeting your parents at political events. It seems just like yesterday when I'd drop in at John and Agatha at the end of the hall. They were wonderful, hospitable people. Now both of them are gone. Please know that my thoughts are with you as you put prepare for the funeral and say a last good-bye to your Dad. Thinking of you as you prepare for the funeral. What wonderful memories of John and Agatha from here on 6th floor. Your dad always had a smile and a laugh for everyone. Very special. Take good care of each other. our thoughts and payers are with you at the very difficult time. Wonderful Plum Coulee farm life memories that will last forever..